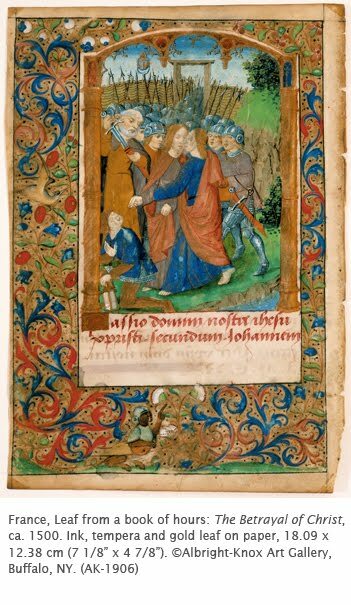 I’ve really admired the work of manuscript illuminators since I went to the Newbury Library at the University of Chicago while in grad school. I got to actually hold some of these precious works in my own two greedy, art historian hands. Before that I had only seen manuscript pages projected as slides in a classroom, I had no idea about the size of these beautiful little books. They’re the size of post cards! I’d go blind trying to paint that small. In Western art, they’re an important bridge between the ancient world and the Renaissance. This page comes from a group we just accessioned from the Albright-Knox Art Gallery in Buffalo, NY. After the fall of the Roman Empire (roughly 5th century CE) large scale painting virtually vanished in Western art. What little painting existed was in the form of illustrated religious books. These manuscripts followed the style and format of late Roman manuscripts, featuring the writings of ancient philosophers illustrated with either full-page or small miniatures. During the early Christian era (ca. 500–900 CE), printing was not available for the mass dissemination of books. Texts were copied by hand, a majority of them in monasteries and convents. Thus began the tradition of illuminated manuscripts. When learning and affluence increased in Western Europe, more elaborate illustration was desired by patrons of manuscripts. Professional artists replaced monks and nuns as the primary decorators of books. With a renewed interest in realism in art during the early Renaissance (ca. 1400–1450), manuscript illuminators produced elaborately decorated pages such as this one. Not only does it provide a window into a space on a 2D surface, it also features elaborate floral border surrounds. Some scholars believe that the increased attempt at realism in manuscript illustrations like this French example sounded the death knell to the importance of the art form, eventually leading these same artists to take up panel painting, and extending their subject matter to portraits and genre scenes. Take a stroll through other fabulous book illustrations from across time and place in the DAI collection.